With a view to encouraging and informing reflection, the McDonald Centre in association with Christ Church Cathedral will stage the following series of public lectures during Hilary Term. 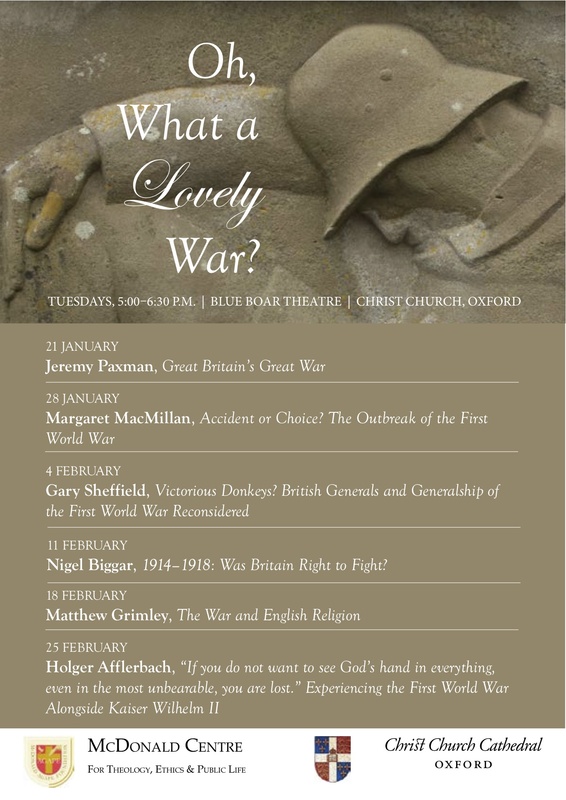 Nigel Biggar, 1914–1918: Was Britain Right to Fight? The programme for The British World War One Poetry Spring School has now been announced. This is the second spring school run by Oxford University’s English Faculty. The School is open to (and aimed at) members of the public, and particularly at those who have read some WW1 poetry but are now seeking a deeper critical appreciation. It will bring together world-leading experts in the topic, each invited to give an introductory lecture guiding the attendees to further avenues of study. Speakers will be encouraged to put together reading lists and follow-up exercises for students to do after each lecture on their own. Speakers include Adrian Barlow, Margi Blunden, Meg Crane, Guy Cuthbertson, Gerald Dawe, Simon Featherstone, Philip Lancaster, Stuart Lee, Jean Liddiard, Alisa Miller, Charles Mundye, Jane Potter, Mark Rawlinson, Jon Stallworthy.